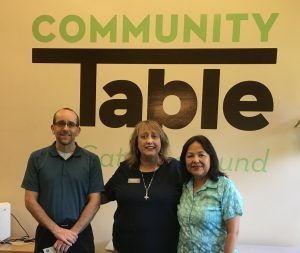 Community Table has been recognized with its second consecutive 4-Star Rating from Charity Navigator for demonstrating strong financial health and commitment to accountability and transparency. According to Michael Thatcher, President and CEO of Charity Navigator, “The intent of our work is to provide donors with essential information to give them greater confidence in both the charitable decisions that they make and the nonprofit sector.” He continued, “Only 30% of charities evaluated by Charity Navigator have achieved at least 2 consecutive 4-Star evaluations, indicating that CT outperforms most other charities in America.” Follow this LINK to visit the Community Table page on the Charity Navigator site. Are you aware that one of the many services that the Bridges to Opportunity program can provide is emergency financial assistance for eligible individuals living within our service area? Through a partnership with City of Arvada and area faith- based communities we have limited resources to pay for rent, a deposit, transportation assistance, and other emergency needs. Call Community Table to get more details – – 720/437-6388. 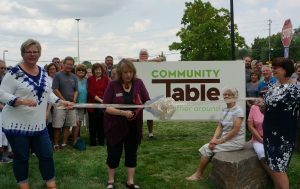 Community Table celebrates the official ribbon cutting for our new name! Thanks to the Arvada Chamber of Commerce, our board, staff, volunteers and members of the community for joining with us to celebrate our fresh identity and updates to our facility. Congratulations to Ed and Maro Dimmer and the entire team at Rheinlander Bakery for another highly successful Bake Off for Hunger promotion. 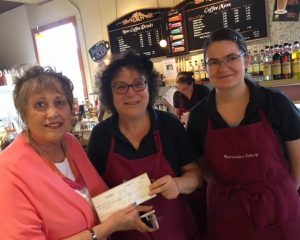 Community Table executive director Sandy Martin accepts a check in support of Community Table and our Feeding the Future program. Thank you Arvada for visiting Rheinlander in June — and we encourage you to visit whenever you’re in the market for fabulous baked goods! 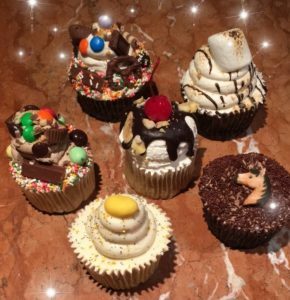 Who doesn’t love a delicious cupcake? Rheinlander Bakery in Olde Town Arvada is proud to announce that every time they sell one of these five amazing cupcakes in the month of June– Banana Split, S’mores, Everything Candy, Lemon Poppyseed and Dark Horse (an ultra chocolaty delight) — they will donate $1 to Community Table’s Feeding the Future program supporting school-age children. 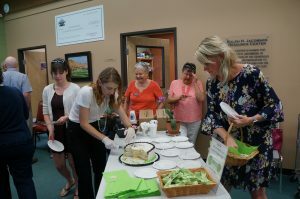 So treat yourself today (or every day between now and June 30th) and feel good forever by joining with Rheinlander Bakery in support of Community Table. We are looking to extend our Client Shopping Hours on Thursdays. We will need volunteers to assist with Client Check in for a 3 hour shift, starting at 9:00 am. Must enjoy interacting with the public, as you are the first contact with visitors to our Food Pantry. For more information regarding the position, please contact Gretchen Parker, at 720/437-6388, or gparker@cotable.org. We would love you have you!! Community Table President Jill Fellman spent some time recently with the team at Awesome Arvada Podcast/Hunter Bay Coffee to talk about our new name, and some of our recent events and fundraisers including last month’s National Association of Letters Carriers Stamp Out Hunger Food Drive and Rheinlander Bakery’s Bake Out Hunger event happening June 2 & 3. Follow this link to learn more! 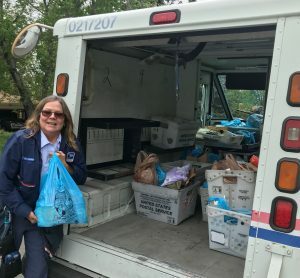 Thanks to members of the National Association of Letter Carriers, employees of the City of Arvada, volunteers and residents of Arvada and Wheat Ridge for donating, collecting and sorting 79,934 pounds of non-perishable food during the May 12, 2018 Stamp Out Hunger Food Drive. Since 1991, the NALC and the Stamp Out Hunger Food drive has provided a critical partnership with food banks throughout the country as they start running out of donations received during the Thanksgiving and Christmas holiday periods. Every year the Westminster Legacy Foundation awards grants to local nonprofits that are working to make Westminster a better place to live work and play. Community Table is proud to have again been selected as a Grant Recipient. Thank you Westminster Legacy Foundation for your ongoing support of our work!